We work with reseller partners in the UK, Ireland, Sweden, Philippines, Malaysia and Australia and welcome new partners. 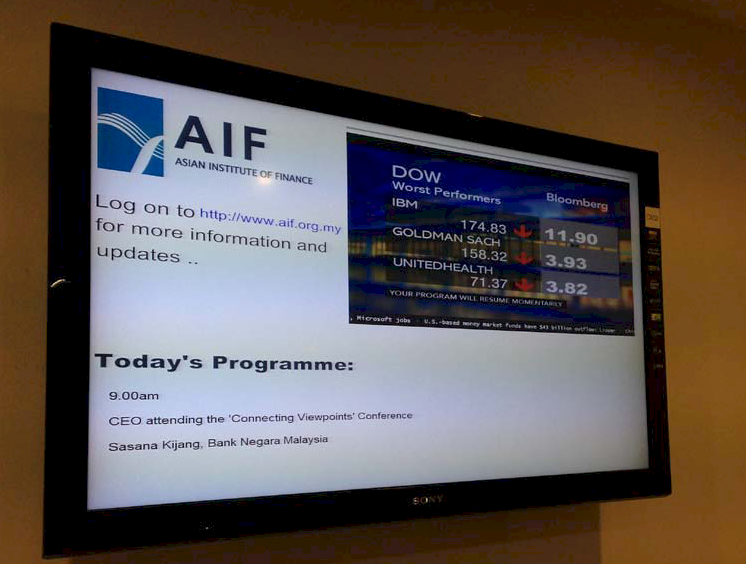 The Asian Institute of Finance (AIF), Kuala Lumpur, Malaysia, focuses on developing human capital across the financial services industry in Asia. Established by the Central Bank of Malaysia (Bank Negara Malaysia) and the Securities Commission Malaysia, AIF is committed to elevating Malaysia's role as a premier provider of comprehensive solutions for the financial sector across the region. "The main objective of Repeat Signage in my organization is to publish my CEO's agenda on a day to day basis. Apart from his agenda, we have incorporated a live video stream of Bloomberg TV and a flash RSS feed placed at the bottom of the video". Wai Keong, Chang, Information Technology, Asian Institute of Finance (AIF). The benefits of Repeat Signage digital signage software is its flexibility in allowing you to easily create presentations, which can be scheduled at different times of the day or week, and update content via local network, from a website or over our Internet server with a one-time licence fee.